Across the globe, Caritas programmes empower women to grow food or learn skills so they can earn a living and feed their families. 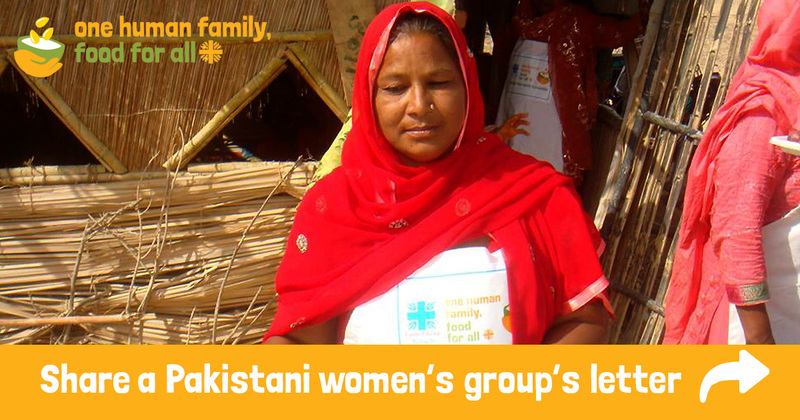 A group of women in Pakistan wrote this letter to other women’s groups, sharing their experiences and success. Share this inspiring letter written by a women's garden kitchen group to other women who are struggling. Greetings from the women’s group of Caritas Pakistan Karachi! We live in rural areas or slum areas of the biggest city of our country. Day by day it was getting hard to buy expensive vegetables. We could only cook one meal for our family per day, as the prices of things kept increasing daily. Every shop has its own rate here. When there was violence or a strike in Karachi, our men were not be able to go to work. At those times, we all went to sleep hungry, because we had no money to buy vegetables. But after starting a Kitchen Gardening programme, and attending the training from Caritas, we came to know about planting seeds of various vegetables. These home-grown vegetables taste good and we don’t use chemicals; we hope this improves our family’s health. Our children eat fresh vegetables to fight against malnutrition. Our monthly expenses have gone done and now we save from 1500 to 1200 rupees (12 euros), the money we used to spend buying vegetables. Our relatives and neighbors also take vegetables at least twice a week. We advise you to learn about kitchen gardening. Start growing plants where space is available. This really brings change. Now, when there is violence or a strike in Karachi, we can pick home-grown vegetables and cook them for our families and children. Join hands with “One human family, food for all” and become independent.